Description: One of the definite oddballs in all of the Gatchaman video collection has to be this sole public release of the Gatchaman feature film. It was offered on a disc format called VHD in Japan which utilized an optical disc housed inside a protective hard plastic case. Once inserted into the player, the approximately 10-inch disc was actually read with a needle, much like a record player. It was similar to, but wholly incompatible with, the RCA SelectaVision format sold in the United States around the same time. 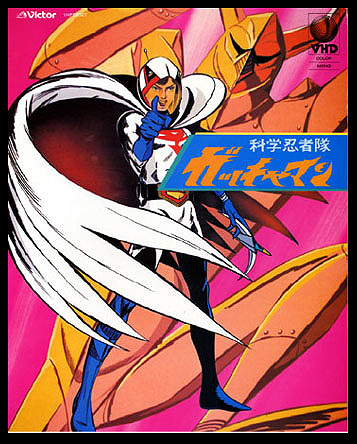 But the technology for VHD playback was rare even when it was new in Japan, and for whatever reasons the Gatchaman feature never saw another home video release on film, VHS or LaserDisc. No chapter markers were indicated. The film was spread to both sides of the disc and there were no additional feature or extras beyond a brief description on the back cover of the sleeve. Artwork for the sleeve consisted of previously-published pieces.